Beat Jegerlehner gets ready to leave McGrath, Alaska, after reaching the 350-mile point of the Iditarod Trail Invitational on Sunday, March 3. Photo by Steve Ansell. I apologize for the sparse updates on this blog during the past week. Life often gets in the way of even the best intentions, but the Iditarod Trail Invitational continues its long grind along the wind-swept expanse of the mighty Yukon River. Since I last posted here, all 48 starters finished the race to McGrath, and seven competitors continued on toward Nome. Cyclist Bob Ostrom leads the Nome race at mile 652 in Kaltag, with Italian cyclists Ausilia Vistarini and Sebastiano Farvo not far behind. Lead runner Tim Hewitt is working his way up the Yukon River, with Beat Jegerlehner about a day behind in Grayling at mile 530. Marco Berni is close behind Beat, having slowed his pace to deal with serious blisters. Klaus Schweinburger and Shawn McTaggert are still on the trail to Iditarod, somewhere near mile 432. Beat has made a number of call-ins to report his ongoing struggle with challenging trail conditions since he left McGrath. He and Marco Berni started traveling together shortly after Takotna, joining forces to take on the infamously steep and relentless hills of this unpopulated section of the course. Unseasonably warm temperatures softened the trail conditions, slowing their pace from a comfortable 3.5 miles per hour to an arduous 2 miles per hour. The warm weather also opened up significant sections of overflow, a term for flowing water that runs over the top of ice on stream beds, rivers, and lakes. Some sections were as deep as his thighs, and he and Marco struggled to keep their gear dry as they made these crossings. After Iditarod, a ghost town that today is nothing more than a checkpoint for the Iditarod Dog Sled Race, a wet storm moved in, bringing high winds, sleet, and even rain. Beat and Marco attempted to travel more at night and sleep during the day in hopes that the trail would be better, but temperatures didn’t drop below freezing long enough to set up the trail. Overflow conditions persisted, and Beat described long miles of walking through “a translucent 7-11 Slurpee” and other variations of wet slush. Luckily there are a few shelter cabins along this section of the trail, and Marco and Beat were able to catch naps indoors where it was possible to dry out gear. 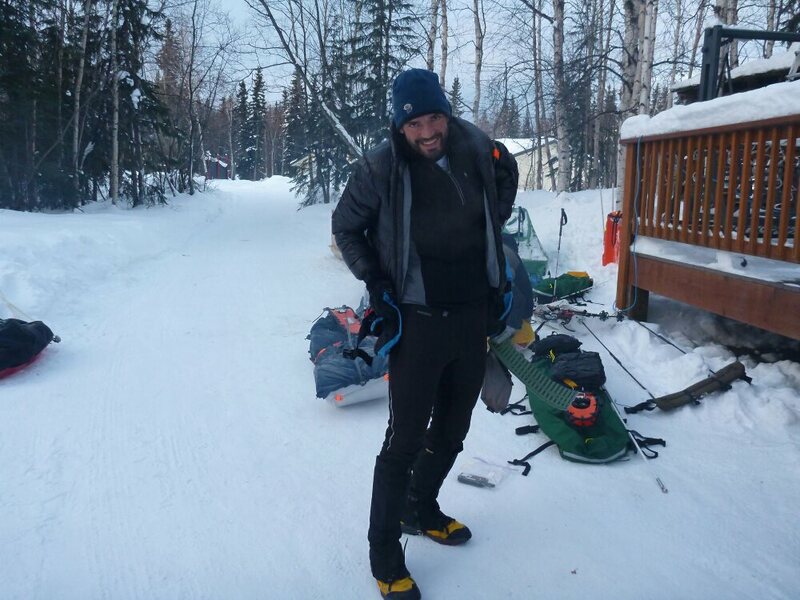 Just outside the village of Shageluk, mile 487, Marco opted to stop and take care of blisters that had become seriously infected. Beat made the decision to continue forward in hopes that Marco would catch up later, but for now he is traveling alone. 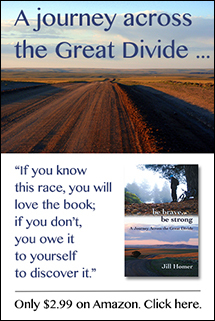 On Sunday morning he reached the village of Grayling, mile 530, after a night of pressing through a blizzard. Beat said the storm dumped at least four inches of wet snow on the trail, with deeper drifts in places as the wind persisted. His gear had become wet again and the difficult push left him exhausted. “I’m completely shattered,” he said. But he hoped a warm schoolroom to stay for the night and fresh provisions would help him recharge for the long march up the Yukon River. The Yukon River segment is 122 miles without any permanent settlements or much traffic to speak of. It’s known to be a lonely stretch of trail. I’ll try to keep posting more regular updates about Beat and the other Nome racers here this week, as well as get back to business with other coverage on this blog. Stay tuned. Jill, good luck to Beat. Just finishing your third book. Your tenacity is an inspiration for me to meet my 250 days of cycling in 2013, even when it’s wet, cold the conditions are nothing like Beat and you conquer. Wow! It looks like Beat is doing really great! I’m curious if he is happy with his gear and food choises so far?